For my final project in my Intro Studio 2 class (in conjunction with my Intro Seminar 2 Final Essay), which was critiqued, and presented at an art show that was held at the end of the semester (week of May 8th), I was tasked with creating a final object that encompasses the research paper topic of my Intro Seminar 2 class final research paper, my own interests, and the information I found about my artist (in my case Chip Kidd) that I did a “trap” for for my last project (Bridge 4, as I recall). Knowing that Chip Kidd liked superheroes like Batman as a kid, and knowing my own interests in science fiction as well as my research paper topic for Intro Seminar that would talk about the “mythology of flight”, and the “mythology of the fighter pilot”, I sought to create something that could equally represent these aspects of my Intro classes. 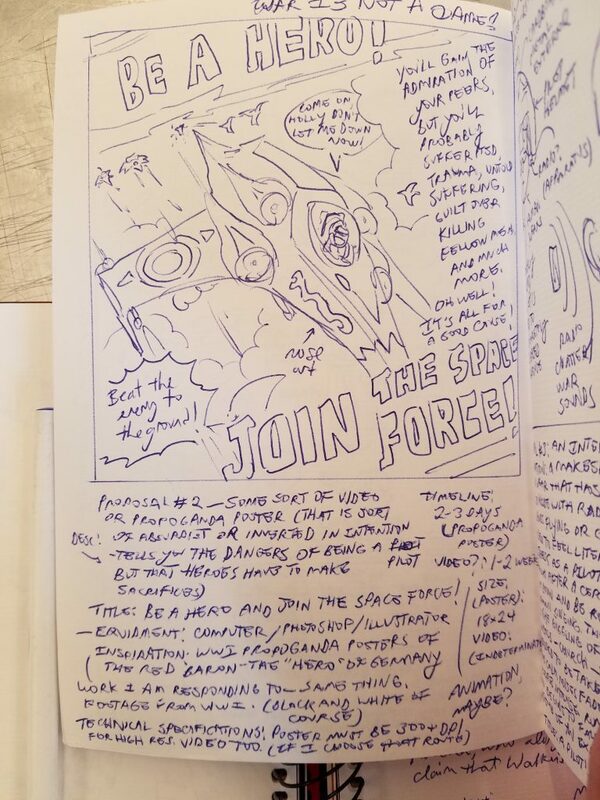 Since I was tasked with creating a proposal booklet a few weeks back in April, I initially had three ideas on the table: My first idea was a propaganda poster telling people to join “Star Brigade” or some sort of arbitrary fighter squadron to fight in a war against aliens. This idea was inspired by WWI and WWII recruitment posters used by the government and military to distort people’s perceptions of fighter pilots, forming a mythology of them as invincible fighters protecting their nations (glorifying them, even). 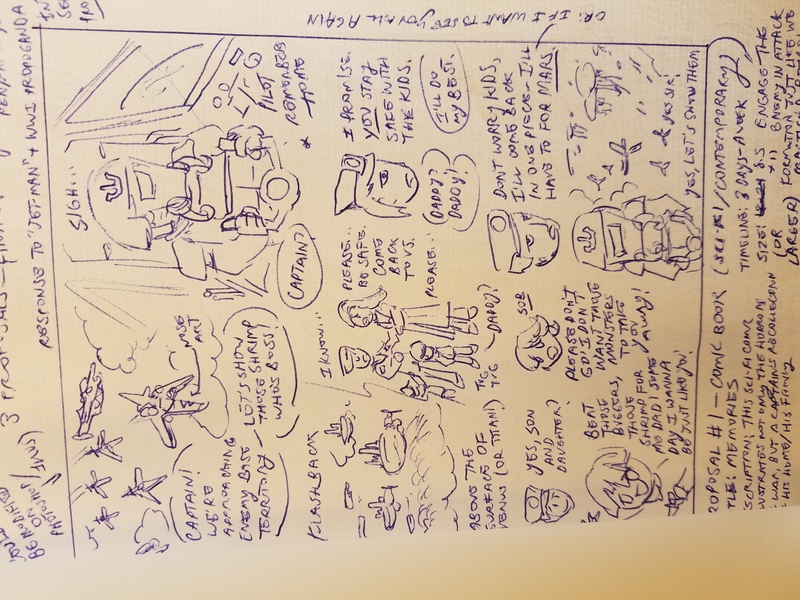 My second idea was creating a comic (inspired, of course, by Chip Kidd’s superhero aesthetic) that would depict the ultimate mythological fighter pilot-hero, the Red Baron in a science fiction setting recalling his home and his family, seeing his life flash before his eyes knowing this will be his last duel with aliens. 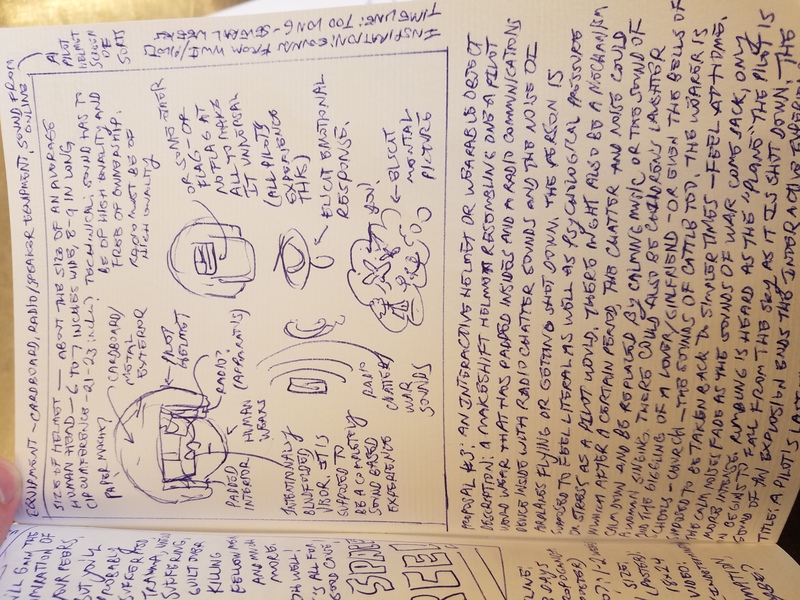 My third and final idea was much more experiential and sensorial in that it was not a comic nor a poster, but a physical object– namely, a papier-mâché or plastic replica of a fighter pilot helmet that would have radio equipment inside of it, and padded insides to filter out outside noise and make the wearer slightly more comfortable in what would soon transpire. The wearer would be blinded by an opaque visor in front of the helmet, which would force him/her to rely purely on sounds and imagine what is going on in their heads within the helmet. The radio equipment would have recorded sounds of war, fighter planes moving at high speeds, planes getting shot down, radio chatter and pilot terminology, the screams of people falling from the sky, the sounds of machine guns and crashes, and more. Midway through all the chaos, the sounds would slowly fade and be replaced by more sweet-sounding, soothing and calming music alongside sounds of the wind, the sounds of rushing waves and rustling trees, children laughing, church or school bells ringing, chimes sounding, a female (possibly a lover) whispering words of affection, the sounds of car horns and possibly a baby (or babies crying), indicating past memories of a peaceful life prior to war-time. After several minutes, the sweet sounds would fade, and the chaos of the experience of being a pilot would return, except louder and more menacingly. Sounds of bombs and explosions boom through the radio equipment, radio chatter becomes increasingly erratic as klaxons, sirens, and the sounds of nuclear missiles being fired are heard echoing through the headset. Finally, a loud explosion blasts through the radio headset of the helmet, and the sounds of a plane being torn apart is heard before the inevitable whine of the plane the “wearer” is in spirals out of control and crashes upon the ground. Silence follows after the screams of the pilot as comes crashing at high speed from high altitudes– his death is imminent and there is nothing he can do. The ejection button, and the parachutes fail, indicated by a voice that says “ejection equipment unavailable”, followed by the pilot’s curses. 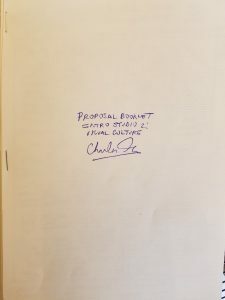 This third project would have been able to easily capture the trauma of war and the reality of what pilots have to go through, which is a subtopic in my Intro Seminar 2 research paper, and it could have impacted my classmates significantly considering the sensory deprivation of the visor of the helmet. Out of the three proposals that I had in my booklet, I chose with the help of my professor the second option– the comic– since she felt the propaganda poster would be too “easy”, and that the pilot helmet model would be too time-consuming and ambitious for me to finish before the art show in May at the end of the semester, considering my other final projects and assignments for other classes. I did not get a chance to work on the comic during the last week of April, but started working on it the first week of May (it should be mostly done by the time of the art show). 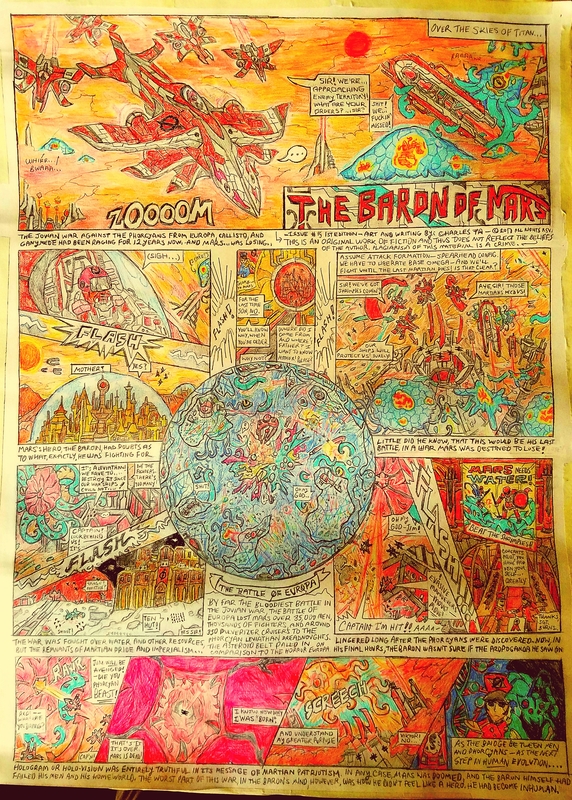 The comic is called “The Baron of Mars”, and is a science fiction version of my topic about the “mythology” of pilots for my Intro Seminar final paper (how they were glorified by the media but denied help for their persistent psychological issues and traumas), as well as how they dealt with the psychological burdens placed upon them as pilots. 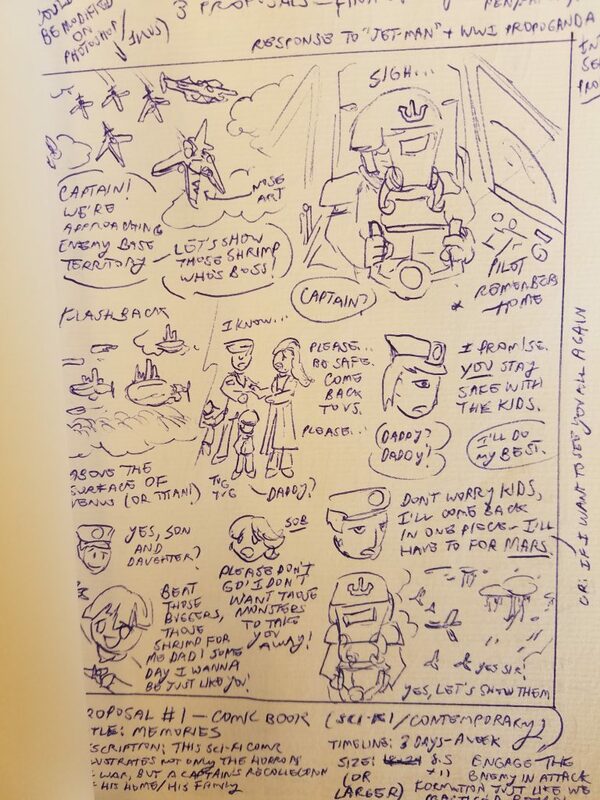 The comic derived inspiration from the Red Baron, and aviation history during WWI, WWII, and the wars that followed after, and is also mostly inspired by a sci-fi short story I wrote for my Intro Fiction class of the same name. 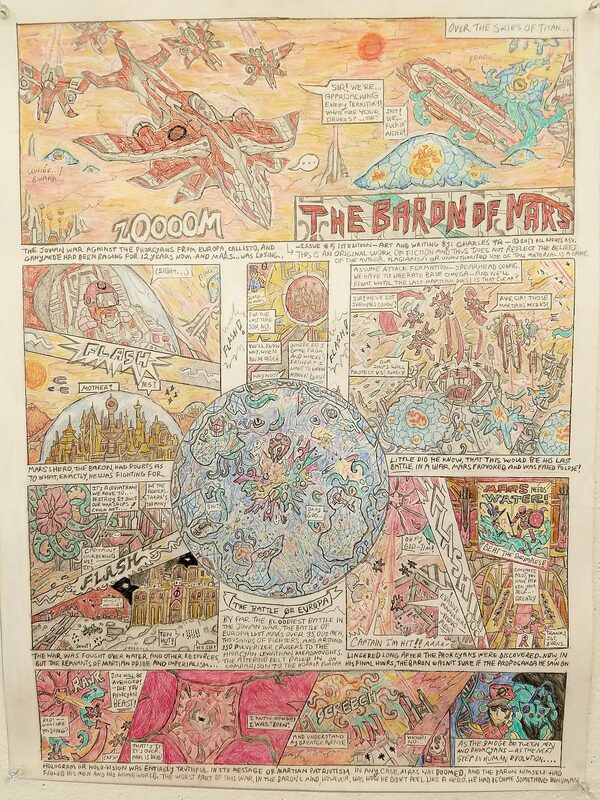 The format of the comic (with the circle in the center) was directly inspired by an issue of Windsor McCay’s Little Nemo comic book series– which is fantastical and imaginary in the same way my comic deals with a far off future set on different planets. Above and below are pictures of my proposal booklet, and my comic colored and saturated. For the comic, I used 18 x 24 Bristol Paper, pencils and Micron pens (005 for thinness and detail), colored pencils, and a bit of editing and scanning software (Photoshop, school printing) to make the final product look spiffy, neat, and beautiful. 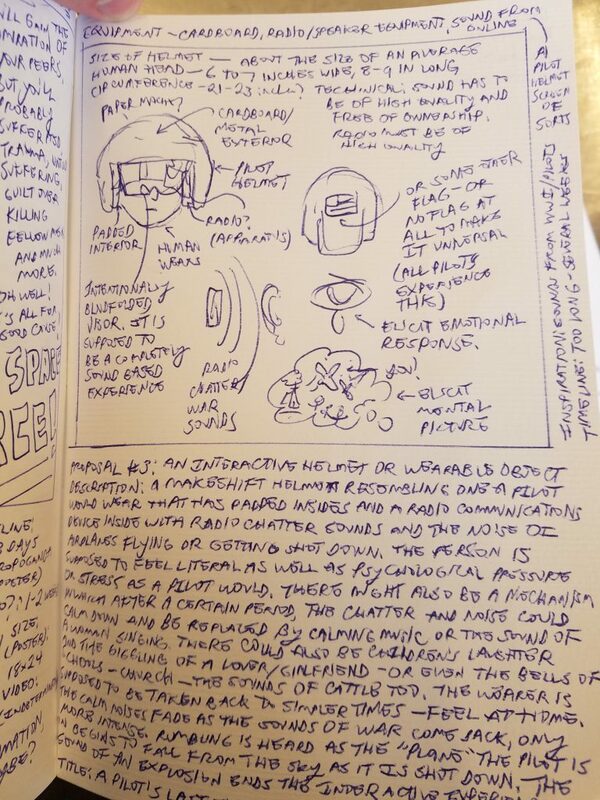 As part of the art show I presented my comic in, I was tasked with writing a 150 word artist statement to accompany my piece stating its purpose and what it explores + what inspired it. 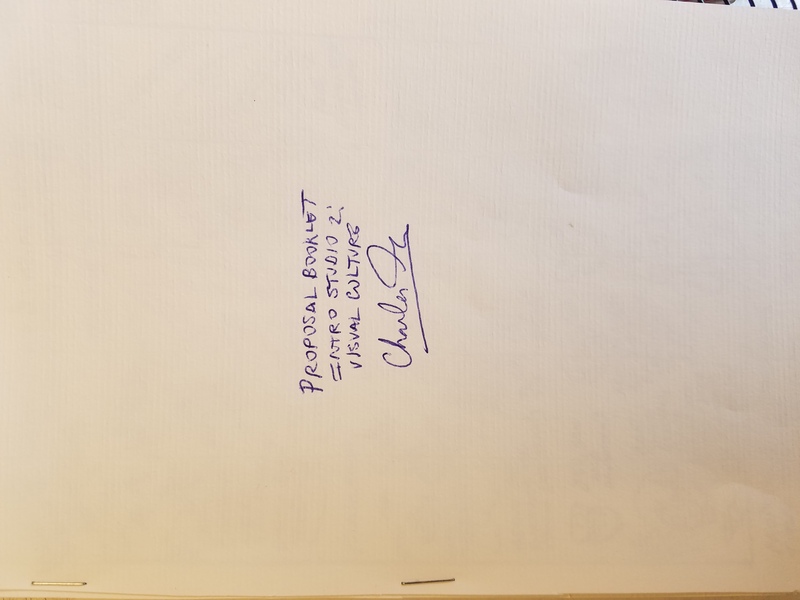 Below I have included my artist statement as well as a link to my Intro Seminar 2 Final Essay, as well as its annotated bibliography. My art piece deals with conflict, suffering, war, and with grand, epic storylines set in past times or eons in the future. 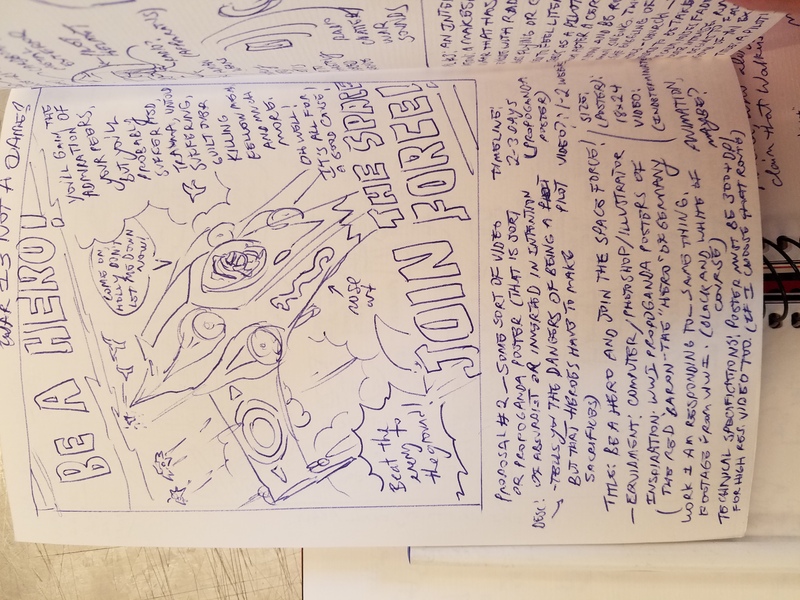 Inspired by mythological ideas, historical context, Star Wars and other similar sagas, and by current political issues between nations or larger entities, “The Baron of Mars” chronicles the tale of an ace pilot who faces his imminent death at the hands of an interplanetary war– a war that runs deeper and reveals more about its participants than its propaganda claims. Excruciating detail emphasizes richness in the world my comic strip embodies. Created using colored pencils, Micron pens, and paper, the story of the ace pilot parallels or is derived from my own indirect experiences with war and suffering, through the plight of my parents who were both born in oppressive countries– Vietnam and Cuba– and lived through the terrors of Communism and war. Planes, Pilots, Psychology and Propaganda: Mythology or Mayday?